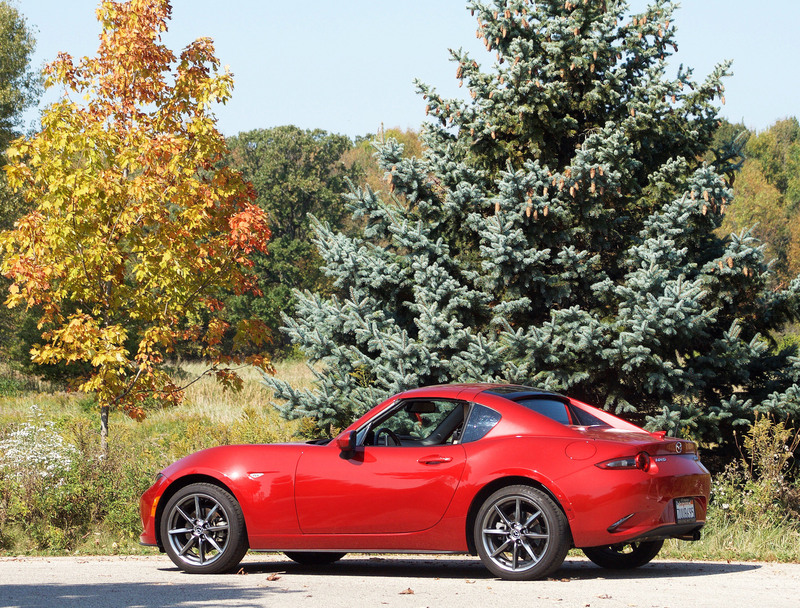 A couple years back Mazda slightly downsized the MX-5, a rare act in the car world. The goal was keeping it light and lively, not letting it take on a middle-agers’ weight around the beltline. The nose was further smoothed, but more muscular front fenders added to give the driver the feel of being in a more substantial roadster, like a Corvette. Its taillights are round, resembling modern Ferrari models and not a bad styling cue to borrow. So the RF, like its soft-top cousins, is down several hundred pounds in weight, measures about 6 inches shorter in length and rides on a slightly smaller wheelbase. It’s a tidy package. The result is a superbly balanced sports car that remains light, peppy and easy to throw around curvy country roads, or winding suburban streets. Power is quick and instantaneous as the 6-speed manual is exceedingly well suited to the 2.0-liter I4, which creates 155 horsepower. Shifts are short and direct, with a hint of notchyness, and the clutch is light. Whether winding my way along rural roads or through sprawling subdivisions I enjoyed Miata’s quick go-kart-like direct steering. And with the top down I could smell the crispness of the autumn leaves and feel the warmth of the setting late-summer sun. Even pricey performance-oriented German sport sedans are no more fun to drive than this rear-drive Miata. Braking from its four discs is firm and steady, so as you zip into a corner and hit the apex if the rear feels the least bit loose you can slightly drag the brakes to right the car’s motion. Fun! There’s traction and stability control, so mostly the car feels well planted and is extremely easy to drive. 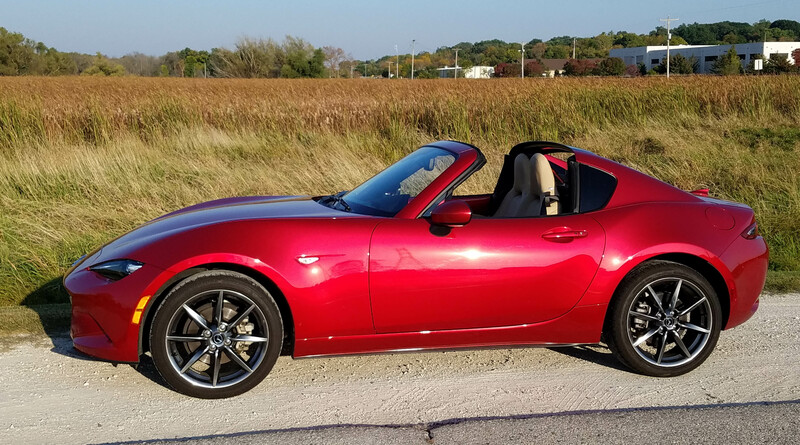 The downside, as it has been for years, is that the car’s super short wheelbase means Miata has a jittery ride especially when navigating Wisconsin’s chippy roads. But this is a car you buy to add exhilaration to your drive, not loll in soft squishy leather-wrapped comfort. Still, the Miata’s seats are pleasantly snug to hold you in place during semi-aggressive driving. The tan leather seats are comfortable for short and tall drivers. Mazda managed to gain one notch in the reclining seatback that helps taller drivers gain a tad more space. Seats remain manual, keeping weight down. The MX-5 weighs just 2,445 lbs. Most cars, crossovers and utes register between 3,000 to 4,000 lbs. Some weigh much more. Miata’s dash remains simple with three gauges in front of the driver, three round air vents and oddly one rectangular one. 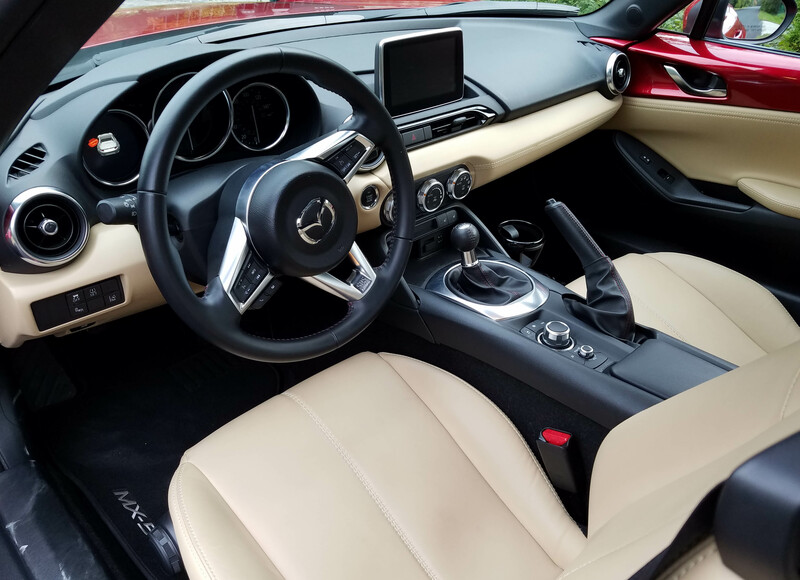 This is similar to the Mazda3 and CX-3 dash, but pleasant. It includes a good-sized navigation/radio screen that extends out of the dash’s top for clear visibility. The test car also had some carbon fiber-like trim on the door armrests, satin metal look on the steering wheel hub and soft-touch dash and buttons. This one, a Grand Touring model, had a sharp-looking tan leather interior with black over tan dash and red stitching on the black leather wheel and shift knob. The door’s top edges and panels matched the car’s “Soul Red” (a bright metallic red that costs $300 extra) exterior. Dash climate control knobs are large and there are three-level seat heat buttons there too. The RF also comes with push-button start. While there’s no rearview camera, the GT comes with a blind-spot warning system and rear cross-traffic alert, both helpful in a low lean car such as this. A lane departure system comes on the GT too, but I left it off most of the time. If you can’t keep a car like this between the lines you’d best start praying that autonomous cars are just around the corner. 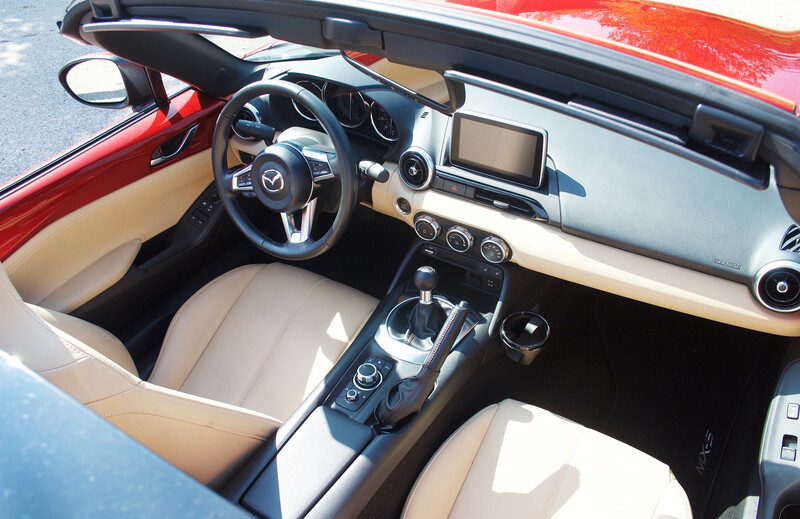 The radio/nav screen is large enough to view easily, except when the roof is down and the screen becomes washed out by sunlight. Hopefully you’ve already tuned in your favorite station prior to dropping the top. This car’s Bose sound system also featured a weird buzz or hum. It only occurred on occasions (like there was temporary interference), but the buzz was quite noticeable and also lowered the volume substantially for several seconds each time. On the plus side there are radio speakers in the car’s headrests to help passengers better hear the radio once the roof has been lowered. There’s a manual tilt wheel here, no telescoping, and the usual assortment of trip computer, phone, radio volume and cruise control buttons on the hub. There are a couple storage boxes behind and between the seats. A CD player also is in the center stack console extension behind the seats. Considering the car’s size and its power hardtop, the cargo room is fine. The trunk will hold a couple overnight bags or one moderate-sized suitcase and a few small items. Sun visors are tiny and do not flip to the side, so pretty useless. You’ll need a good pair of wraparound sunglasses if you are light sensitive. Fuel economy though is stellar. The EPA rates the roadster at 26 mpg city and 33 highway, but I got an impressive 34.0 mpg in a week’s driving and well split between city and highway driving. Sadly, to boost the car’s power, it prefers to drink premium fuel. At least it doesn’t drink it quickly. The entry-level Club version of the RF starts at $32,430, with delivery, while this GT begins at $32,620 before adding an $835 delivery fee. With just a couple options the test car was $33,885, a few grand shy of an average car price today. So even with its hardtop, the Miata remains an affordable sportster. An automatic transmission is available and adds 40 lbs. to the car, plus $1.205 to the price tag. An automatic also seems to run counter to the car’s spirit and intent. 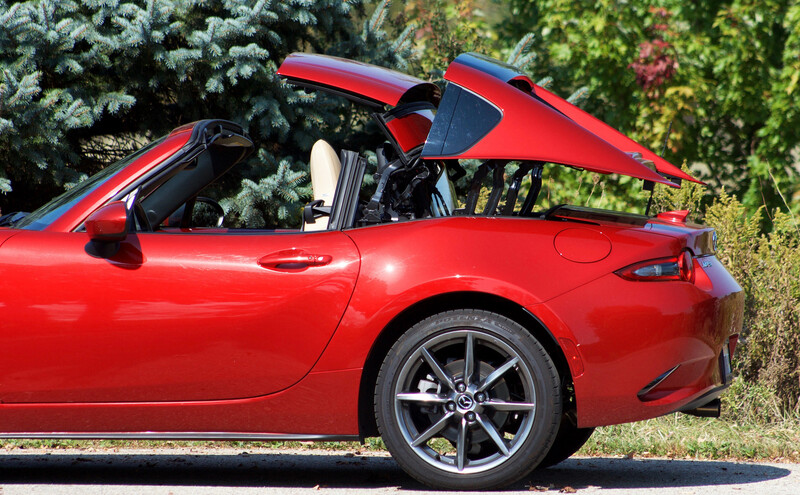 Buyers wanting to save money or simplify their drop-top can opt for a manual cloth-roofed model. Those start with the Sport model at $25,750 and range up to the GT at $30,900. 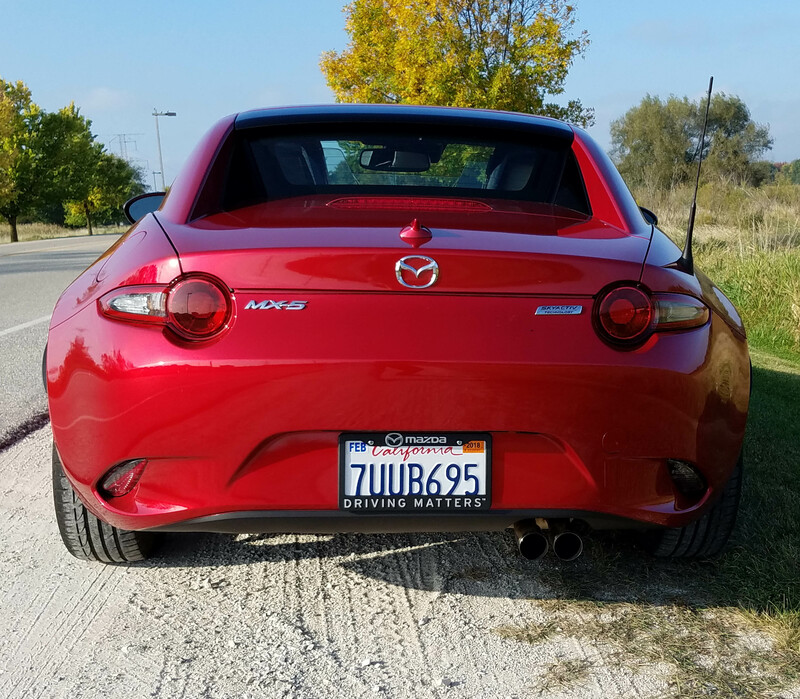 For folks looking for a slightly more sophisticated ride with a quieter interior, the RF is the way to go. 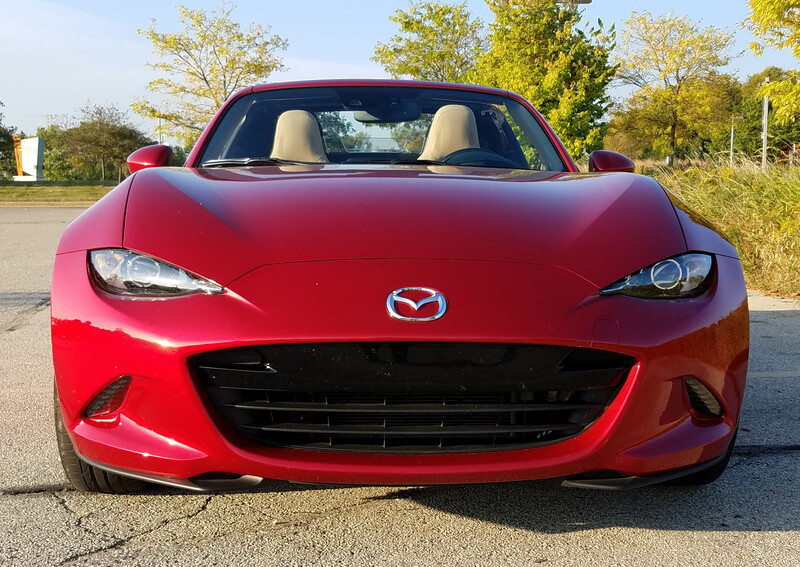 And while the soft-top Miata is cute, the RF bumps up the car’s curb appeal, looking even more exciting. Driving one proves it! Hits: Light, airy sportster with cool profile, excellent handling, easy shifts and zippy performance. Excellent fuel economy, easy power hardtop retraction and still trunk space, plus heated seats, blind-spot system, big climate knobs and simple dash. Misses: Jittery ride, odd radio buzz, drinks premium fuel, has useless sun visors. Nice little car indeed! Great post, cheers.